I spent the whole of last week on a Britannia’s Dragon research trip in north-west Wales. Coming originally from the south-west of the country, where it’s far easier and quicker to get to London than to the north, I knew Anglesey and Snowdonia quite well but didn’t really know the Llyn Peninsula, and this proved to be a revelation – in terms of stunning scenery, fascinating history and a sometimes total absence of such alleged requisites of modern living as mobile phone reception and internet access. We were staying in a converted chapel on the old pilgrim route along the peninsula to Bardsey island, and evidence of the importance of pilgrimage was everywhere, nowhere moreso than in the astonishing church of St Beuno at Clynnog Fawr, larger than several cathedrals I’ve visited yet located in a village smaller than the one where we live. The week also involved some walking, notably a strenuous climb up to the Tre’r Ceiri hill fort, and a visit to Sir Clough Williams Ellis’s surreal creation at Portmeirion, best known of course as the setting for the cult TV series The Prisoner. But of course I was in the area primarily to work. My days at Anglesey and Caernarfon record offices were very productive, particularly the former (which produced inter alia what must be the most graphic description ever written of the state of the toilets on a World War I battleship). Both proved to be very pleasant working environments, both manned by really helpful and friendly staff and with that at Caernarfon enjoying some of the best views of any repository I’ve ever worked on; the search room looks out directly onto the quayside of the old dock, now filled with yachts and with the waters of the Menai Straits beyond. ‘Fieldwork’ took me to many places with direct or indirect naval connections. 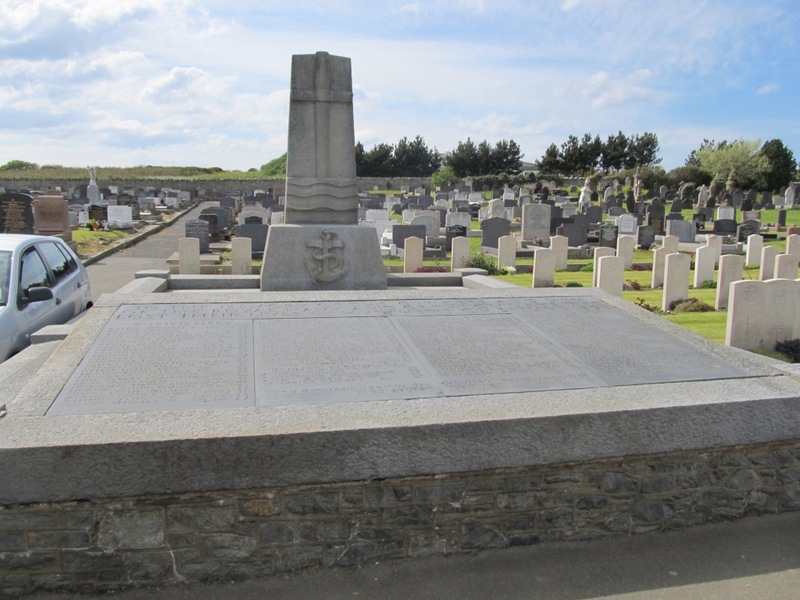 By far the most poignant of the former was the huge memorial and mass grave in Holyhead cemetery to those who died aboard the submarine HMS Thetis in 1939, which failed to surface after her first trial dive; the vessel was subsequently recovered, beached in Moelfre Bay and eventually put into service as HMS Thunderbolt. A site which certainly does proclaim its naval heritage is the astonishing Parys Mountain on the north coast of Anglesey, once the largest copper mine in the world. The discovery of this huge resource in 1768 coincided providentially with the Royal Navy’s adoption of copper sheathing and with the outbreak less than a decade later of the American revolutionary war, which hugely increased the demand for that sheathing. The nearby port of Amlwch was transformed into the world’s largest copper port and the second largest town in Wales, about half the size of late C18th century New York. Parys Mountain is remarkable but somewhat unsettling, a vast scar on the landscape literally carved out of the heart of a hill – and, in the early years at least, carved out principally by manual labour and hand tools alone. So all in all, it was a very good week which contributed a substantial amount of material to the book. Although a considerable amount of additional research still lies ahead, the writing phase starts tomorrow!